The Zebra 800012-601 clear transfer film is required for printing in all Zebra ZXP Series 8 ID card printers. The image is reverse printed on to the film and then the film is mated with the ID card. This gives a rich clear and lasting card,while allowing for over the edge printing. The Zebra 800012-601 film is for use with the Zebra ZXP Series 8 ID card printers. 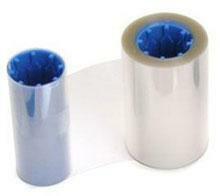 The Zebra 800012-601 retransfer film is for use with the Zebra ZXP Series 8 ID card printers. No results found. Please try again!